This has been packed and shipped and on its way to a new home. 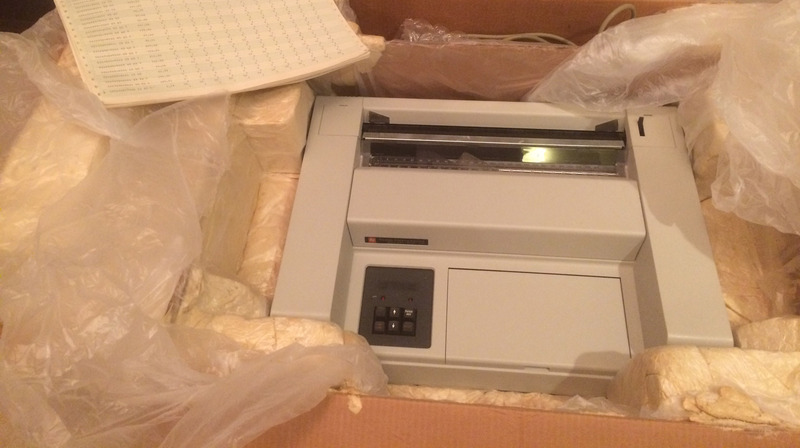 Texas Instruments Omni 800 Model 840 printer for free! Formerly owned (and probably used at work) by a TI employee here in Houston. It even comes with TI work product! I have not tested the printer at all so I make no claims on its work ability. I can't keep this around any longer and need to get rid of it. If I can't find any takers then it will sadly have to go to the recycler. Edited by Mitkraft, Sun May 14, 2017 10:03 PM. I check the printer out in order to see about testing it and get some more pictures of the connection. I opened up the top panel and found that apparently there were several places where originally some foam pieces were attached to the inside of the printer and on the underside of the lid. All of the foam looks like its dried and crumbling. Some pieces have come detached. Because of this I'm not even going to attempt to power it on or test it. There is another thread on this as well in the TI forum where a few people have expressed interest and have first refusal option but it isn't completely spoken for just yet. I'm making a run to the recyclers on Saturday. If I don't have a reasonable expectation of a taker by then I'm taking this as well. I've had several tire kickers in the thread for it in the TI 99/4A section but interest seems to have dwindled. Edited by Mitkraft, Mon May 8, 2017 3:32 PM. Its a 840 RO (write only) vs a KSR which would have a keyboard making it a hard copy terminal. Used where you needed a hard copy terminal... Chemical plants, telephone systems. This is just a serial printer version. 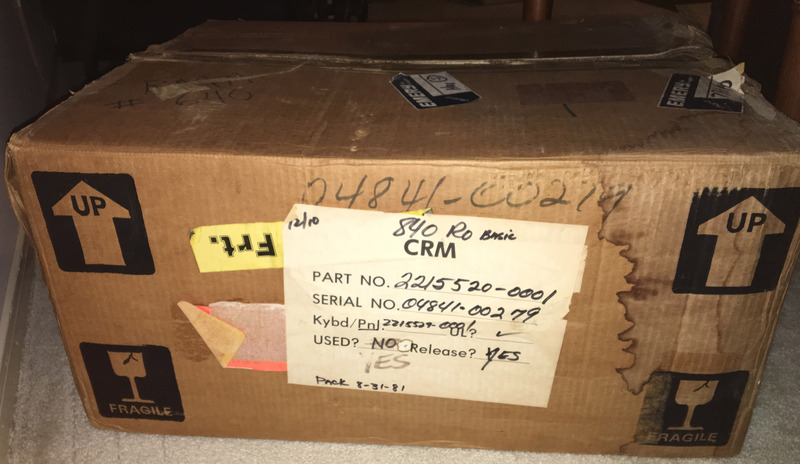 "CRM"on the box means Customer Returned Material which means it was purchased and returned or it came off a lease. 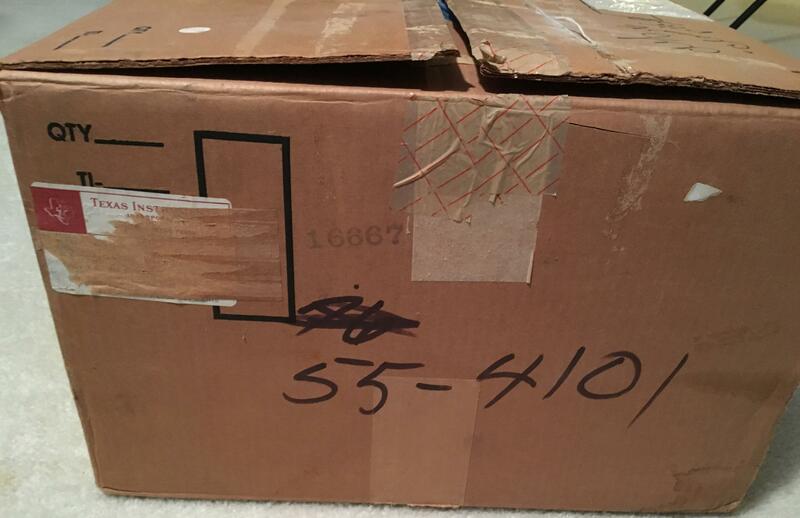 Date marked on the box looks like maybe 2010 so the ribbon maybe dry and not print. It won't go into TEST mode without paper in it. It should print a barber pole. Under that little door is a test button along with buttons to set margins, paper length and to configure the serial i/f. It had a optional parallel i/f but you had to remove a piece of the case. 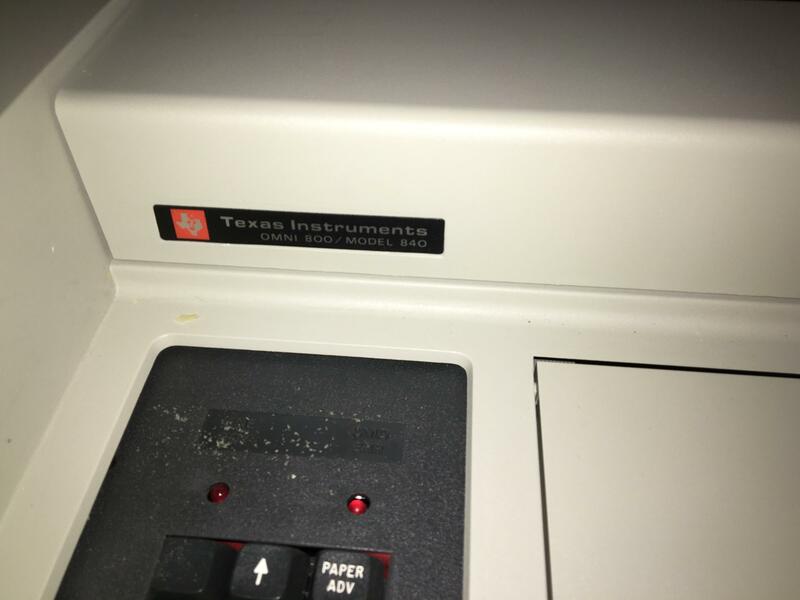 There are some square slots for telephone RJ12s but they probably don't have connectors in them since this version is only a printer, no modem. TI's TPD Division Temple TX (terminals/printers) was sold to Genicom in 1992 when the Computer Div Austin was sold to HP. Not sure if Genicom kept the 840 going. The 99/4a (most of this site is concerned with) was Consumer Products Div outta Lubbock. (calculators, watches, speak n spell etc). Not sure what happened to them. TI sold the Defense Group Dallas to Raython and Geophysical group Dallas to Halliburton. Pretty much returning to be a Semiconductor company. I was with the Digital Systems Service Div outta Houston for 13 years. Most of the TI repair co in Houston are outta business. Preferred Computer Service (my company), CalTex Computers, Omni Data, Linco, BBS. You might try Data Refects Computers, used to be off Tidwell, I think they are on Brittmoore now. Bill Leach 713-937-0099. You can try Lake Erie Systems (Erie PA) www.fastprinters.com or Trident Computer (Troy MI) www.tridentcomputer.com. If you are trying to find a local user, your best shot would be old Farm Implement dealerships (John Deere & National Farm and Power Equipment Dealer Assoc) or a Ford Dealer as they were all big customers. Also Churches and Boy Scouts of America had TI UNIX and Xenix systems. It was HP's intent to swap those for 486/586 servers and both Ford and NFPEDA computer s/w support moved to a west coast VAR that sold IBM Netfinity. I think they were eventually bought by UCS who was bought by Reynolds and Reynolds. Wow, that's one hell of a first post! Welcome to AA and thanks for all the info. Still looking for someone to claim this. Hey, I didn't look closely at the picture of the printout. The ROP/SIQ forecast report has my hand writing on it and my name checked off. Feb of 1983 to Jan 1984... amazing. District 07 is Costa Mesa CA. 99A = sum of all technicians. ROP = reorder point. SIQ = standard issue quantity. I worked in Field Service inventory planning with Mark, Mike, Kaz, Ben and Bruce. We were automating our inventory system based on svc call forecast by model number and parts listing. I still have a couple of those guys emails. So are you saying this printer LITERALLY has your name on it? Maybe it should be yours for the low low price of FREE (pickup)! I'm mostly PO'ed those guys still haven't fished reviewing that report and given it back to me. finished not fished - damn auto correct. I think we should meet for lunch one day. Clearly you must have something to tell me or I to tell you... or this wouldn't have happened. Is there anything else in that box? diamond ring, money? I am leaving the country for a week on Saturday. Let me know if you want to do it before or after. Pending payment of shipping it looks like I have a taker. I'll update the thread when its a done deal or if anything changes. Thanks all! Craig, I'll shoot you an email but it will have to be after you get back. With this weekend being Mother's day I'll be busy I'm sure. Wow...bringing back some memories for me with this entire post! I didn't work for TI, but I did work for a large service provider that supported the hardware for American Airlines back in the mid 90s to early 2000s. As a tech instructor for that company, it was my job to train the new field engineers how to work on and support the stuff. 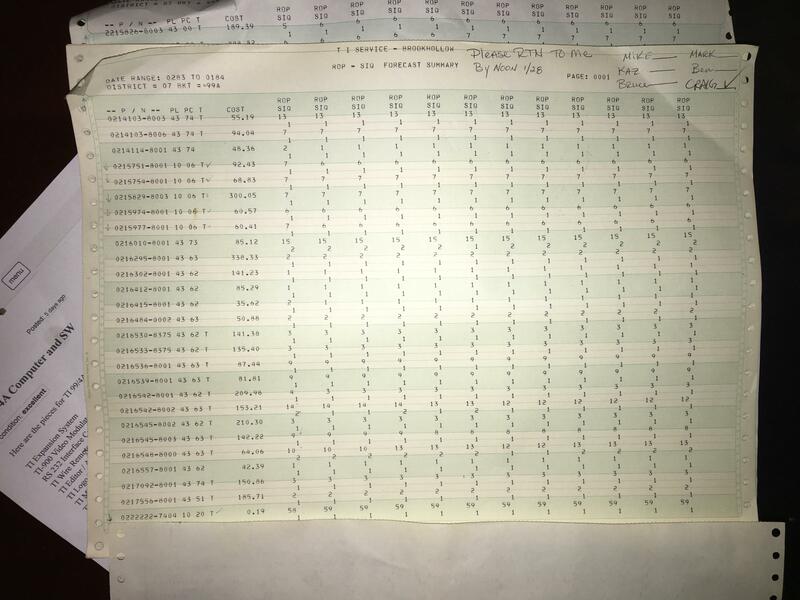 Most of what I taught, dealt strictly with TI printers. Mainly those used in the airlines industries... ATB2000, ATB1600, and TI-810, plus the Omni 800 series (Mainly the 885 and 895 models). What I remember most was that you could pull out one of the printer boards in the 885/895 printers, and when you powered it on, it would immediately go into the ascii barber pole. You could also hold down the paper adv or feed button while power cycling to get a different print test. But the barber pole was the best to use to really show possible mechanical and print issues. And yes...TI's printers...were built to withstand the tests of time. However, the Genicom name didn't begin to appear on these printers until well after 2001 as I recall. Likely, most of our customers had had them so long that they hadn't needed to get full on replacement printers since they were so easy to work on and replacement parts were so plentiful. Wow, this brings back memories. I was the guy that designed the digital electronics for the Omni 840. Texas Instruments was my first job out of college - from 1978-1981. I started out on a cost reduction project for the 810/820 printers, then designed some test fixtures for these printers for manufacturing, then was assigned to the 840 project as the microprocessor/digital design engineer. I did the digital design and as I recall a guy by the name of Mike Badger did most of the analog design, a room-mate of mine - PJ Pipitone, another college rookie - and Jeff ??? (Schultz?) did the mechanical design, Bill ??? (Bray?) did the power supply, and Mike Gleason did the bulk of the firmware programming. The project was headed up by a guy named Bob Collier - never liked the guy. We used to call him Bargain Bob behind his back. The 840 was TI's 1st attempt at building a low-cost impact printer - to compete against Epson and Brother. To be honest, it was never really successful. We cut a lot of corners to make it as cheap as possible. That's why we called our boss Bargain Bob. Let's see - if memory serves, it had a Zilog Z8 8-bit microprocessor, and some related Zilog parts - a UART for the serial port, and maybe a DMA controller. I remember that PJ designed a neat clutch mechanism for the ribbon cartridge, to keep the ribbon moving in one direction while the carriage moved left and right. Got a patent for it. Another neat cost cutting feature was a mostly 1-piece injection-molded chassis that all the mechanicals attached to. Saved a lot of parts and made manufacturing easier. After we launched the 840 I decided I didn't like Houston summers anymore and moved back east. But, it was a great learning experience.